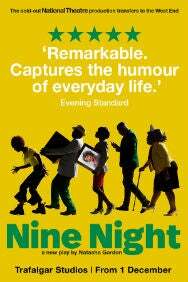 We do not curently have theatre tickets available for Nine Night. This could be because we have simply sold out or it could be that this show is no longer running. The information on this page remains purely for historical and informational purposes. Gloria is gravely sick. When her time comes, the celebration begins; the traditional Jamaican Nine Night Wake. But for Gloria’s children and grandchildren, marking her death with a party that lasts over a week is a test. Nine nights of music, food, sharing stories  and an endless parade of mourners.